If you are a .NET developer that creates IIS or self-hosted WCF services, then you will probably have the need at some point to secure the transport with a SSL certificate if using a http binding type. If you have a WCF service hosted by IIS, applying a SSL certificate is a bit more trivial because the endpoint configuration does not dictate the URL. The virtual directory in IIS will create the URL for your endpoint. However, if you are hosting your WCF service in a Windows Service, you dictate the endpoint and applying the SSL certificate is a little more involved. Because of this you may want to create a self-signed SSL certificate while still in development to ensure that your 'https' endpoint works correctly. With IIS websites, legacy .asmx services, or WCF hosted services, applying a SSL certificate happens after the fact via IIS and the initial testing with a SSL certificate may not even be desired. Regardless of your situation, the following tutorial shown you a simple procedure to create a self-signed certificate on your local machine. So what is a self-signed SSL certificate you may ask. A 'CA' or Certificate Authority is a trusted provided to generate a SSL certificate. Your local machine is a CA, but unfortunately and as expected the CA on your machine is not trusted (as should be) by any outside party, so any SSL certificate generated locally is good and trusted just there: locally! To get a SSL certificate generated by a trusted CA, you need to go to a commercial provider like 'GoDaddy' or 'Verisign' and purchase a SSL certificate. These Certificate Authorities are trusted on the internet and are able to provide SSL certificates with a set expiration time (i.e. 2 years out). Once applied, you can view the SSL certificate information of a secure site by pressing the secure lock icon in most browsers next to the URL, and will see who issued the SSL certificate, its expiration, and other public details like the public key. If you happen to be on an Active Directory domain doing 'intranet' or internal software development, you may have a CA on the domain that will issue certificates which will be trusted within the domain. This is the way to go so one does not have to buy a GoDaddy or Verisign SSL certificate for every internal WCF service or hosted ASP.NET site. Check with your server folks (unless that's you!) to see if there is a CA that issues SSL certificates trusted by all on the domain. 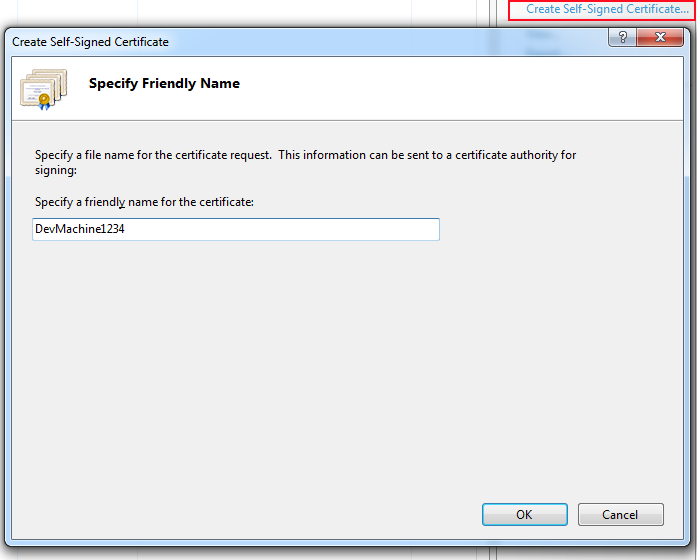 This is the important part which is dictating the friendly-name of your certificate. For local WCF development you really have (2) choices: name the certificate 'localhost' or the name of your machine. I recommend the name of your machine as it is more explicit. So in the example below my machine name is 'DevMachine1234'. The name is important for hosting WCF services and applying a SSL certificate to the exposed endpoint. If the SSL name does not match the domain of the hosted service it will not work. In the case of local development, name the certificate the same name as your machine. After completing the request you will see the SSL certificate has been generated by the local machines CA, the friendly name, and the certificate hash. The hash value will be important in the next post about applying this self-signed certificate to a port number that is dictated in the WCF configuration for a service hosted by a Windows Service. If you are applying the SSL certificate to a IIS hosted service or site, all you have to do is select it from the dropdown when configuring the 'https' binding in IIS7. We have been using self signed certs for ages but a lot of people keep telling me about the pop up boxes they are getting when they try to complete there purchase on the site. So im thinking of dumping open SSL and just buy ssl cert to stop it, though i do not know which on to buy. Do i need a wildcard ssl if im running two websites??? I don't commit to being a 'SSL' expert, but was rather here trying to convey how to use local *test* certificates. As far as not getting the 'prompts' you mentioned, if they are in regards to a non-matching or a non-verified SSL certificate then, yes, purchasing a valid SSL should verify your sites security and end the security prompts. As far as the wildcard SSL question, I *think* that is the answer for multiple sites as long as they have the same domian name (i.e. *.mycompanyname.com). You can check with the SSL provider for the exact details on that question. Your post is truly informative for me and i am so grateful to you for sharing this informative post here. really great job done by you. Useful information for creation of self signing certificate on IIS 6. Thanks for sharing it and we really appreciate your contribution to SSL installation education. We are going to share your blog on our social. I really appreciate you for sharing this detail. I am struggling to obtain an ssl certificate for my website but now with the help of this article I can easily create one. Thanks.